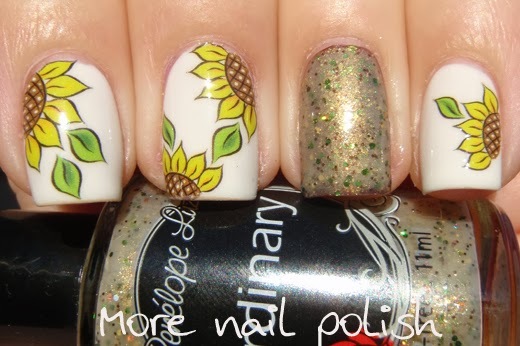 You all know that I love water decals, and I have some new ones that I got from the Born Pretty Store. 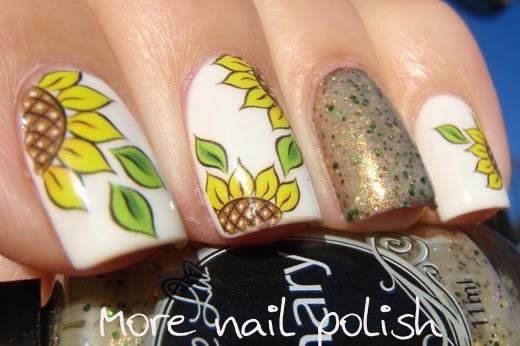 Water decals are so easy to apply and the result is always very neat and professional looking. 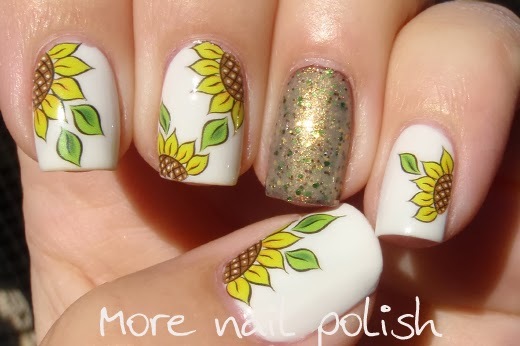 These sunflower ones are so perfect for spring. In fact, I'm actually in the process of growing some sunflowers with Mr 5, our plants are only about 5cm tall at the moment, and I can't wait for him to see how tall they grow and how large the flowers are. They are such happy plants. 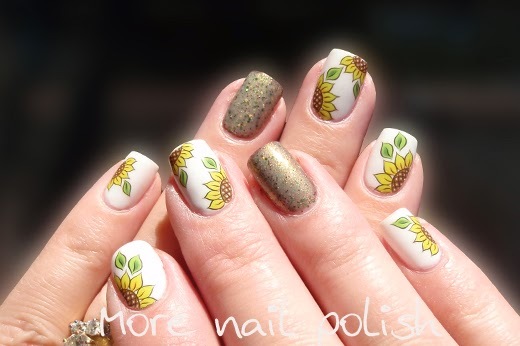 These sunflower water decals come in a pack with 20 decals, that means you'll have enough for two full manis. I painted my nails with white polish, allowed them to dry, the cut out each flower design and soaked it in water for about 20 seconds. After that time, each decal slid off it's backing paper easly and I used tweezers to position it onto my nail. Because of the water involved, you have plenty of time to adjust and reposition your decals. When I'm happy with their placement, I blot the excess water off my nail with a tissue. I used 10 decals in this mani, and doubled up on my middle finger so I could apply a glitter feature nail. The glitter polish on my ring finger is Penelope Luz Ordinary, and it complimented the design perfectly. 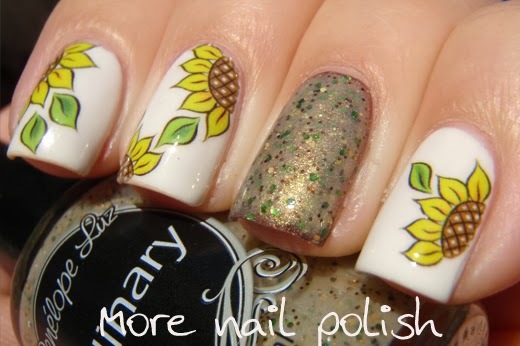 The polish is a neutral golden shimmer with small gold, green and brown glitters. I wanted it to appear a little darker on my nail than in the bottle so I layered two coats over Picture Polish Demeter, but it turned out that two coats of Ordinary was very opaque and you only see Demeter at the very edge near my cuticle. Penelope Luz polishes are available on the Penelope Luz site and they are also available through Color4Nails, who also stocks a good range of indie and hard to get international brands. The water decals were from the Born Pretty Store, and you can use my coupon code of MNPG10 to get 10% their already discounted prices. Muito linda essa ilustração de girassois adorei..
Gorgeous! The decals and accent polish are a perfect match!